True that this is a fall activity but you’ll run out of lists when you count how many more activities can you make of this – counting, sorting, pattern, math, fine motor, five senses, crafts, cards, and more! 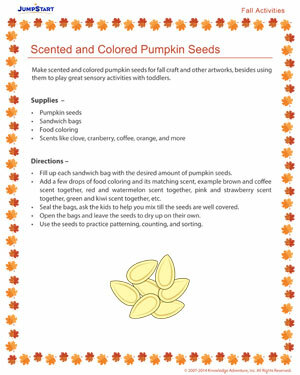 As parents, you can make boxes of scented and colored pumpkin seeds and use them at your convenience to suit the particular activity you plan. As children, they can simply play with the seeds! Make sure they don’t swallow the seeds accidentally.